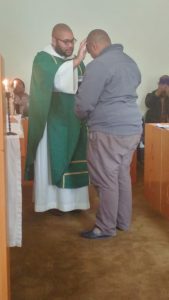 The Environmental Network of the Anglican Church of Southern Africa is delighted to appoint a Youth Coordinator who will head up the work of Young Green Anglicans. Tebogo Makhalanyane better known as Bino comes to the post with a wealth of experience of youth work, as the chairperson of the Provincial youth, and former Diocesan Youth Worker for the Diocese of Free State. At his commissioning service, led by Diocesan youth chaplain Fr Chesnay Franz, Rev Rachel Mash shared a message from the book of Jeremiah 2.
to eat its fruit and rich produce. The older generation have failed in our calling to be good stewards of the earth . We have defiled the inheritance of the younger generation – leaving them with oceans full of plastic, the atmosphere full of carbon dioxide and the rivers full of acid. The youth must now lead the movement, and we are no longer being called to be stewards, we are being called to be healers. and yet the younger generation have also gone astray. Instead of drinking of the living water from the spring that never dries up, they are drinking from cracked and broken jojo tanks. This is seen especially in young peoples desire for ‘recreation” to fill the empty space within them. Rest should be a time for “re- creation” a time of re-creating relationships, of re-creating health instead of stress. And yet we sit together on our cell phone, eating junk and using products that are killing the earth. The challenge for young green Anglicans is to inspire young people to find “recreation” in things that renew and fill their souls, such as hikes, creative activities and renewing the earth. We were grateful for the presence of Fr Chesnay and Tony Lawrence (former Provincial youth Coordinator) as we welcomed Bino to this new ministry .